Robert Malec was a 1944 graduate of Aspinwall High School. 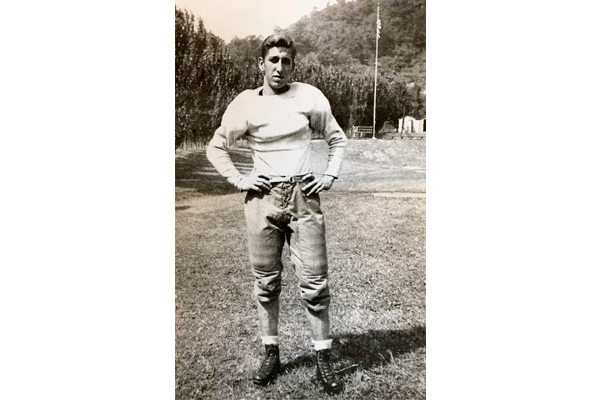 He was an outstanding running back, defensive back and kicker and helped lead the 1943 Aspinwall team to an undefeated, unscored upon season. They played for the WPIAL Class B championship against Pitcairn and came away with another shutout victory, 24-0. Malec, who led the WPIAL in scoring with 111 points that season, received a scholarship to Notre Dame. After his freshman year, he was drafted into the military. After he left the service, he followed his high school coach to Edinboro State Teachers College. He signed a contract with the Richmond Rebels, a Pittsburgh Steelers farm club in 1949. An ankle injury ended his playing career. Malec died at the age of 46 in 1972. He was inducted into the Aspinwall Sports Hall of Fame posthumously in 1977. “He was truly a gifted athlete in which all things came naturally,” said his son, Bob. “He also excelled in golf and bowling. He was a skinny kid from Blawnox. His buddies nicknamed him ‘Ribby’ because his ribs stuck out. After Aspinwall High School closed, the Malec family became avid Fox Chapel High School fans. Bob and his sister will attend the banquet along with their spouses and a few friends.